Carla with 1.03 carat Round Brilliant Center and Matching Band - 14k White Gold - Ring Size 5.25-8.25 was added to your cart. Southwestern-inspired relief patterns meet the slimming effect of a knife-edge band in this adventurous solitaire Contemporary Nexus Diamond engagement ring. 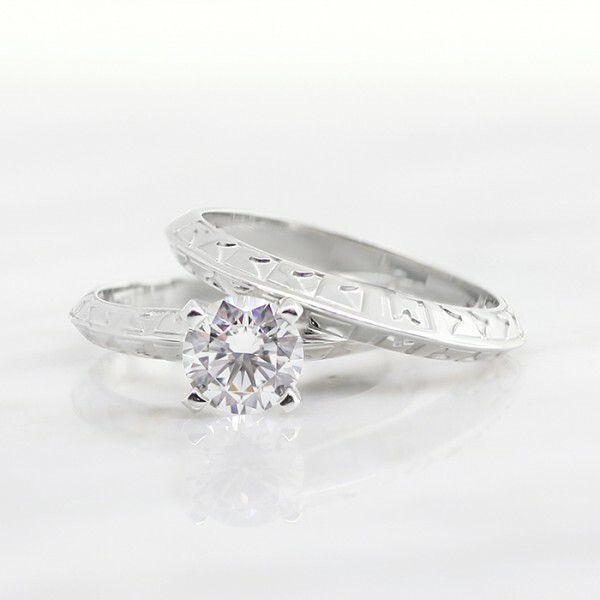 The matching wedding band repeats the pattern, making a delightful bridal set. Center stone: 1.03 carat Round Brilliant cut Nexus Diamond. This ring includes the matching wedding band.